Two years into the latest competition format change at the Canadian men's and women's curling championships, the subject remains as polarizing as ever. "There's no right or wrong," said reigning Tim Hortons Brier champion Kevin Koe. "Everyone's going to have a different preference." In 2018, the defending champion and all provincial and territorial men's winners were given direct entry into the Brier along with a wild-card team. The Scotties Tournament of Hearts also went to a 16-team setup. The format remained a talking point among fans and athletes through the recent 2019 playdowns, likely because interest was higher as it's a non-Olympic season and both events had deeper fields with more top names. Curling Canada scrapped the so-called relegation format after the 2017 championships and replaced it with a system of two pools of eight teams. Qualification games were dumped in favour of a preliminary round that lasts until midweek, followed by a two-day championship round that determined the four playoff teams. Critics of the current format point to the fact that blowouts are common with more weaker teams in the main draw. Some rival teams don't play each other because they're in separate pools. There's also less time to recover if a team has a slow start to the competition. "It really has the feel of two different weeks," said Brad Gushue, who skipped Team Canada the last two years. "You play your pool play and don't see half of the field and then all of a sudden you show up on Thursday and Friday and you've got four really difficult teams. "From a viewer's perspective, you're seeing a lot of mismatched games where they're over early or not close. All of a sudden you get to Thursday and Friday and there's four games out on the sheet that you'd like to watch. From a pure viewing perspective, I really don't like it." Supporters feel the format creates more intensity in the early going. The looming cutoff for the championship round heightens the drama on Tuesday and Wednesday, and top rinks still play hard since their records carry over. "Is this the right format? I don't think anybody knows what the right format is yet," said Northern Ontario skip Brad Jacobs. "I think it's pretty good. At the end of the day, I think it still gets the top four teams into the playoffs at the end of the week. "You're still going to crown a very worthy Canadian champion." The current format ensures all member associations get a main-draw entry. The unpopular bronze-medal game was also dropped last year. "I don't mind the format," said Northwest Territories skip Jamie Koe. "It's not as much of a grind as the full round-robin. The only thing I really don't like is we don't see half the teams in the tournament. I have some good friends in the other pool that you don't see at all because you're on totally different schedules." There is still room for improvement at the events. On the broadcasting end, only one game per draw remains available for television viewers with other matchups given cut-in treatment instead of standalone coverage. An end or two could also probably be trimmed from the current eight-end minimum for non-playoff games. "It's pretty painful sometimes to have to go through the motions for like three ends when you want to quit after five," said Scotties champion Chelsea Carey. From 2015-17, the national championships used pre-tournament qualification draws to determine the 12th team in the field, with the four lowest-seeded provinces and territories playing a round-robin. The winner would reach the main draw and the three losing teams would go home. 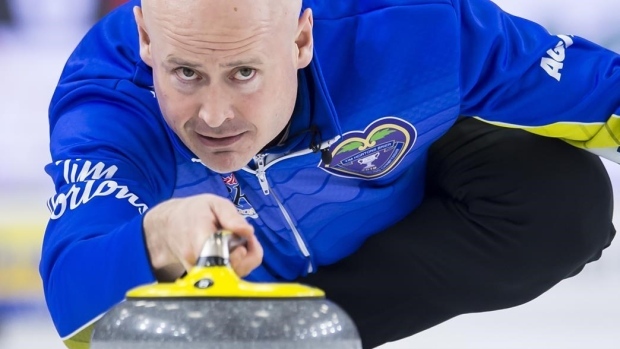 "I thought the format with the relegation was the best," said Kevin Koe. "Then you played everyone in the event. It made all the games for even the bottom teams mean something as the week went on. If you're comparing the two formats, I thought that was better." New Brunswick skip Terry Odishaw is not a fan of either format. "I don't like pools because it takes you away from playing all the provinces and the territories," he said. "Relegation — definitely not that. That was terrible. A team to fly up to the Brier, play three games or two games, whatever it is, and to be sent home before the Brier even starts, no." The addition of the wild-card team has improved the quality of the field. The play-in game is between the top two teams in the Canadian rankings who did not win their provincial or territorial championships. The 2020 Scotties is scheduled for Feb. 14-23 in Moose Jaw, Sask. The 2020 Brier will be played Feb. 29-March 8 in Kingston, Ont. Follow @GregoryStrongCP on Twitter. With files from Canadian Press sports reporter Donna Spencer.